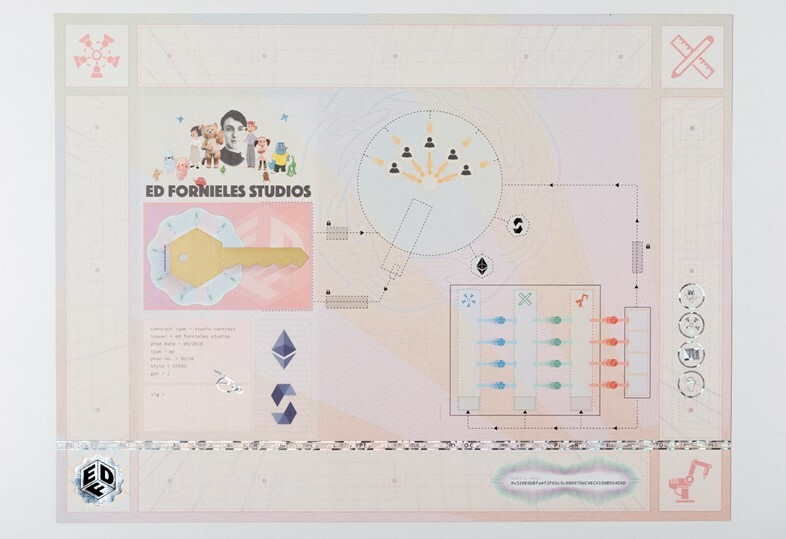 Ed Fornieles made a name for himself a few years back as the poster boy for post-internet art through a series of immersive performances in London, which included a gallery frat party at Guest Projects (“Animal House”, 2011) and an award ceremony honouring Zac Efron at Serpentine Gallery Pavilion (“The Dreamy Awards”, 2012). Since, the multimedia artist’s oeuvre has tackled themes of cultural positioning, social anxiety, and peer pressure, in an ongoing narrative that undulates along the boundary between the real world and its online counterpart. For his latest project, Fornieles unites his interest in abstract data with real-world structures, as he seeks to overhaul the traditional financial model for the production of art. Having recognised the economic constraints of creating conceptual art, not only for artists but also galleries, Fornieles conceived an idea to decentralise the industry and alleviate some of the pressures of being a modern artist. 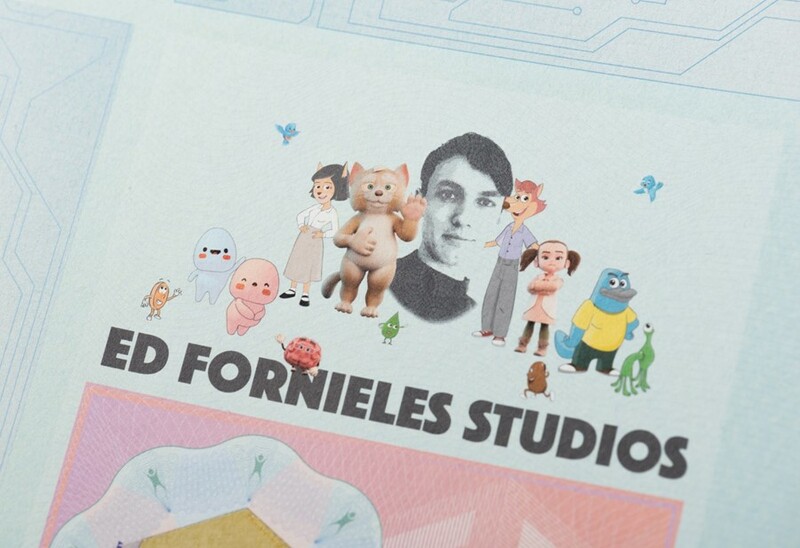 The project, titled Crypto Certs, offers collectors and investors the chance to take more of an active role in the creation of art. 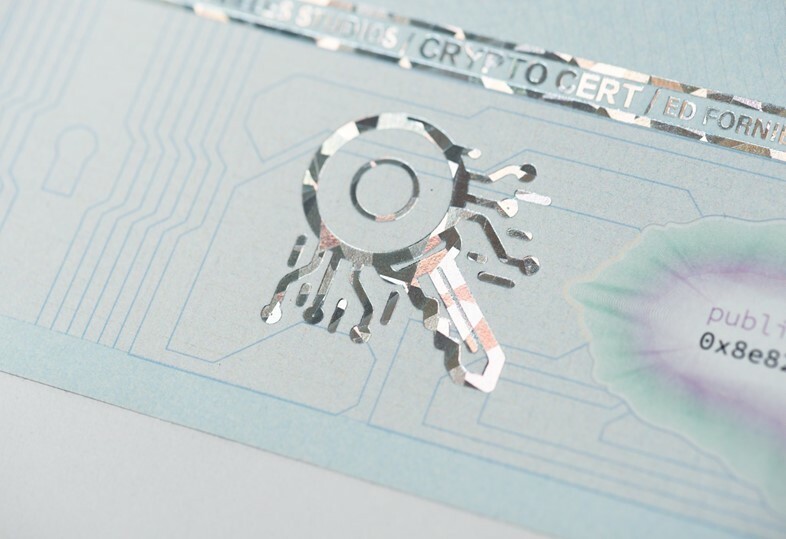 Described as “a hybrid between a financial product and an art print”, the Crypto Certs employ Ethereum blockchain technology to store and distribute value. Each certificate contains a key embedded under a scratch panel, which entitles the holder to a percentage of an Ethereum fund generated through the sale of other certificates. As more sales occur, the Ethereum fund grows and all proceeds from the program are funnelled into the development and production of the artist’s new projects. When the buyer wants to cash out, they scratch a panel and damage the certificate, destroying the art work but taking their profits. The certificate itself was inspired by artist-come-art-world-troll Brad Troemel, founder of prolific “post-internet” art website The Jogging. Fornieles says he was inspired by a sculpture in which Troemel embedded a physical key worth ten Bitcoins. He sold the piece for £5,000, just before cryptocurrency began to gain traction. Fornieles wagers that “at the height of bitcoin speculation, that one piece of artwork was probably worth $1 million and at that point, the collector destroyed the artwork and released the funds”.